Several years ago my mother-in-law generously gave my husband some plants she had grown from seed to put into our garden. Most of the plants were tomato plants but she offered us one eggplant, because she knows that I like eggplant. My husband, however, does not care for it as much as I do, and he had actually at one point said that he would never grow eggplant in his garden. So, it was really a testament of his love for me that he accepted that plant from his mother and dutifully planted it in his precious garden. Sure enough, what my mother-in-law had given us as an eggplant was actually another tomato plant. Obviously, there had simply been a mistake, but my husband still refers to that incident as divine providence affirming his dislike for eggplant. And I’ve found that many people are like my husband and don’t care for eggplant very much, which I just don’t understand. Eggplant provides so many nutrients our bodies need and is an extremely versatile vegetable — one that can be roasted, stuffed, stewed, grilled, baked and stir-fried. They’re a great substitute for meat because they’re very filling without all the calories and fat and have a meaty texture. And they’re one of the few other vegetables which provide those purples that round out rainbow eating. Over the years, eggplant continues to be my husband’s least favorite vegetable, but he’s come to a place of recognizing their benefit — mostly that they’re much cheaper than meat — and acknowledging that the dishes I prepare can actually be tasty, even with eggplant. 2. Make an eggplant dip or spread. Roast a whole eggplant on a cookie sheet in a 400 degree oven for about an hour until it’s soft and the skin is splitting. Scrape out the eggplant from the skin and mash with some garlic, onions, herbs, and a little bit of olive oil. This is delicious as a dip for pita chips or spread onto little toasts and topped with a small crumbling of cheese. 3. Stir fry the eggplant. Some friends just gave me three nice sized eggplants which I peeled and sliced into one inch cubes. Then I stir fried the eggplant with some thinly sliced carrots and mushrooms in a little bit of sesame oil. Once the vegetables were beginning to soften, I added a sauce which thickened nicely and coated the vegetables: 1/2 cup fat free low sodium chicken broth, 1 tsp sesame oil, 1 tsp avocado oil, 1 tsp mince garlic, 1 tsp minced ginger, 1/4 tsp soy sauce, and 1 tablespoon cornstarch – all mixed well. 4. Grill the eggplant. Slice eggplant lengthwise into long, fat pieces, keeping the peel on. Lightly brush the eggplant with olive oil and drizzle herbs, black pepper, and a small amount of salt on both sides. Grill a couple of minutes on both sides until the eggplant is tender. You can then drizzle a bit of balsamic vinegar over the eggplant, and it’s a lovely side dish. 5. Stuff the eggplant. Stuffing vegetables is a wonderful way to use up leftovers in the house, and I think I’ll actually do a post on stuffed vegetables. For now, though, focusing on eggplant, you can use most anything you want — rice, meat, vegetables, bread crumbs, seafood, stuffing, cheese. 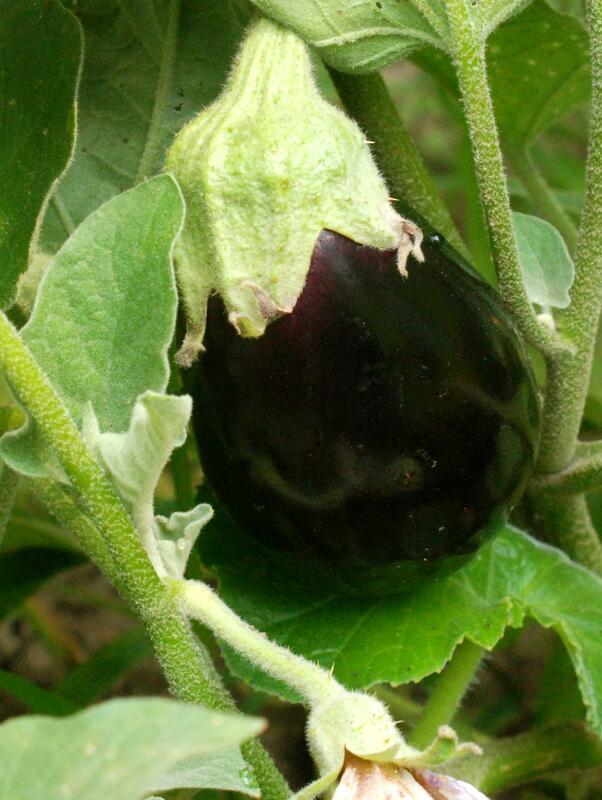 To prepare the eggplant, cut it in half and brush the cut sides with a little bit of olive oil. Bake in a 375 degree oven on a cookie sheet cut side down for 15 minutes and then turn it over and bake for another 15 minutes until the eggplant is tender. Scoop out the insides and mix it in with whatever you’re using as stuffing. Stuff the eggplant and return it to the oven for another 30 minutes to fully heat the stuffing and eggplant together. 6. Add eggplant to your usual dishes. If you’re making a vegetable pizza at home, add some sauteed, chopped eggplant. If you’re throwing leftovers into a stew or soup, add chopped eggplant. If you like to make a fresh tomato sauce for pasta, add chopped eggplant to the recipe. In each of these the eggplant will lend a meatier texture and add flavor. The ideas are endless, and I encourage you to experiment.